Reliance electric water heaters review and buying tips, including the standard and premium Energy Star compliant heaters, with the sizes that cover homes with a maximum of five family members. There are several types of electric water heaters from Reliance, covered by the warranties from 6 to 12 years. The manufacturer produces heaters for a variety of applications; point-of-use and compact type, heaters for mobile (manufactured) homes and heat pumps, while the most extensive line includes the conventional tall type. The most advanced and recommended Reliance electric water heaters are those that include the digital display and heat pump technology as these provide significant energy and money savings, convenient and reliable water heating. From the standard type, these are the units from DART and DARS series with the 12-year warranty. Reliance electric water heaters from the standard group are all built with the two heating elements and mainly standard elements. The DORS series is the basic series and is backed by the 6-year warranty. More advanced water heaters are coming from the DKRT and DKRS series, which are equipped with the self-cleaning system and heavy anode, while the warranty is longer, 9 years. The 50-gal water heater 12-50-DARS has the longest warranty, mainly because of the Sta-Kleen feature that utilizes the self-cleaning system to reduce the sediment build-up inside the tank and on the inner components (i.e., heating elements). The reduction of the mineral deposits at the bottom of the metal tank is what extends the heater’s life and improves the performance. Great features, such as the heavy duty anode rode and quality Incoloy low-watt density heating elements, with the higher electric output of 5500 watts, lead to a greater recovery rate of 25 GPH, high first-hour recovery of 66 gallons and energy efficiency of 0.94. This type is recommended for families up to 4 members. 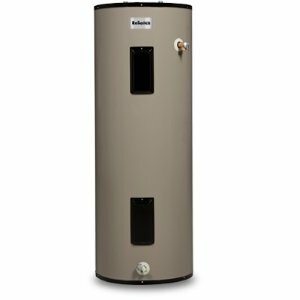 Reliance electric water heaters from the Tall series is the most extensive group that covers models from 30 to 120 gallons. They are built as the conventional type with the warranties of 6, 9 and 12 years while the more advanced such as the heat pumps have the warranty of 10 years. The DORT series offers one model that comes with the greatest capacity; series DKRT comes with the 30, 40 and 50-gal models that utilize the self-cleaning system while the DART and DARS series are the most advanced offering high wattage heating elements, Sta-Kleen system, and a 12-year warranty. Reliance electric water heaters 6-40-SHMS and 6-30-SHMS are the only two models that are designed for the manufactured and mobile homes, providing enough hot water for up to three people and are covered by the 6-year warranty. Reliance Lowboy series are recommended for homes where the standard tall type water heater cannot be installed. The Lowboy units are available in three popular sizes; 30 (6-50-DOLS), 38 (6-40-DOLNS) and 50 gallons (6-30-DOLS), covering homes with the family sizes of up to four members. The water heaters are very short when compared to the conventional type, 30"-34" in height and 22"-27" in diameter, but have almost the same first-hour rating. Point-of-use water heaters are used for the applications where there is a low demand for hot water, such as distant sinks, garages, offices, and rooms with limited space. Small point-of-use models are mainly installed under the bathroom and kitchen sinks or counters. The smallest unit has a 2.5-gallon tank capacity, while the larger one is the 40-gal Table Top unit that is installed in the kitchen, providing the additional countertop space. Both models come with the 6-year warranty. The best of Reliance electric water heaters are actually the heat pumps. These ultra-efficient appliances combine two technologies into the one system; heat pump technology and electric heating elements. Reliance heat pumps are coming with the innovative design that provides excellent benefits for its users such as the extremely high efficiency of 2.35, and decent a 10-year warranty. There are two models available, and the detailed review can be found here.